You may have heard about these before, Overnight Oats are a hot trend right now when it comes to breakfast. Overnight Oats are an instant breakfast. If you haven’t heard about this type of oatmeal before, it is the oatmeal that you simply put in a container with a liquid, and you set in the refrigerator overnight. Then you eat this oatmeal without cooking it straight out of the refrigerator. This makes this recipe perfect for when you want something quick and easy straight out of the fridge. It is a cool breakfast that you don’t need to cook; that’s right this dish is eaten cold. It is no secret that Oatmeal is a healthy meal. It is full of fiber and is filled with protein with the added dairy. Oatmeal will keep you full and energized until lunch. If you are in a rush to get out the door in the morning, this is the perfect breakfast for you. Overnight oats can be prepared in so many ways you won’t run out of new ways to make these overnight oats. Let’s walk through how to make Overnight Oats. I like to use the half pint mason jars. You can use those, or you can use any small container you desire. Small plastic containers with lids will work well. I like to use old fashioned oats for this recipe. Instant oats get too mushy, and the steel cut oats stay crunchy even after them being in the refrigerator overnight. You can use a variety of milk for this recipe, you can use dairy milk, such as whole, skin, 2%, or fat-free. You could also use non-dairy milk such as almond, cashew, or coconut. You may want to stick with unsweetened so you can control the amount of sweetener. I like to use half oatmeal and half milk. You can experiment for what you will like the best. Just like your favorite ice cream place you can add whatever you like. Here are some suggestions. Frozen fruit, fresh fruit such as bananas or strawberries work well. You can use a mix in such any nut butter. Have some Chia seeds, you can add those. You may want to add in spices such as cinnamon, nutmeg, or cocoa powder. My suggestion would be to pick out add-ins that are already completely hydrated. You can also add in sweeteners, I like to add some fresh local honey, but you can add in stevia, sugar, or another one of your favorite sweeteners. Overnight Oatmeal is simple to make, learn how. 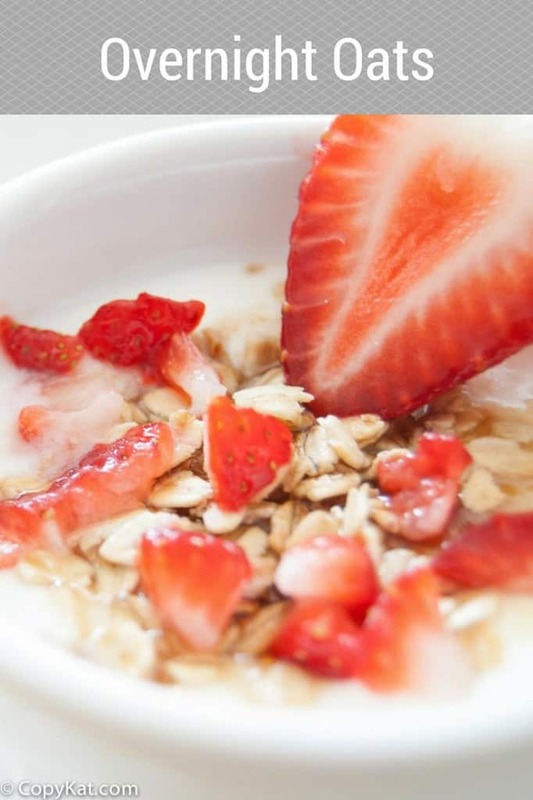 Oatmeal isn’t just for breakfast this would make a great post-workout treat or a great snack. You can read more about Overnight Oats here. Make overnight oats, it's so easy to make. 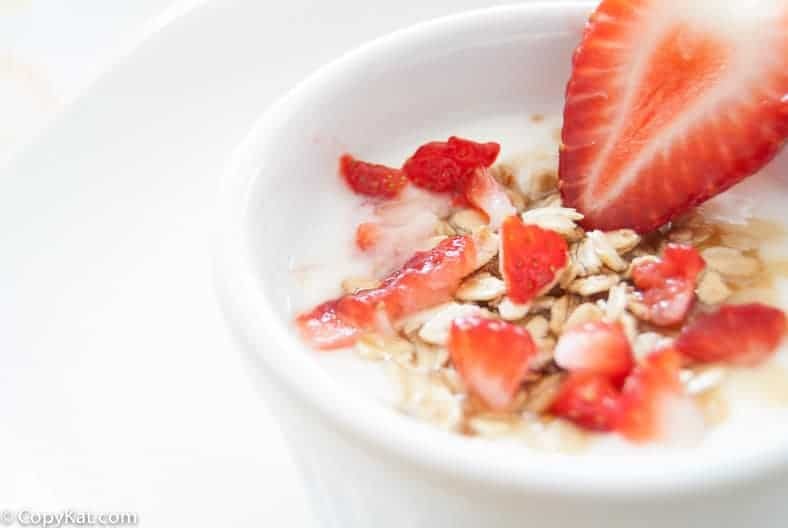 Place oatmeal and milk into a small plastic container. Place container in the refrigerator overnight. In the morning drizzle with honey and chopped strawberries. Can you still warm it up after pulling it from the fridge? For winter mornings? What are your favorite mix in’s for Oatmeal?